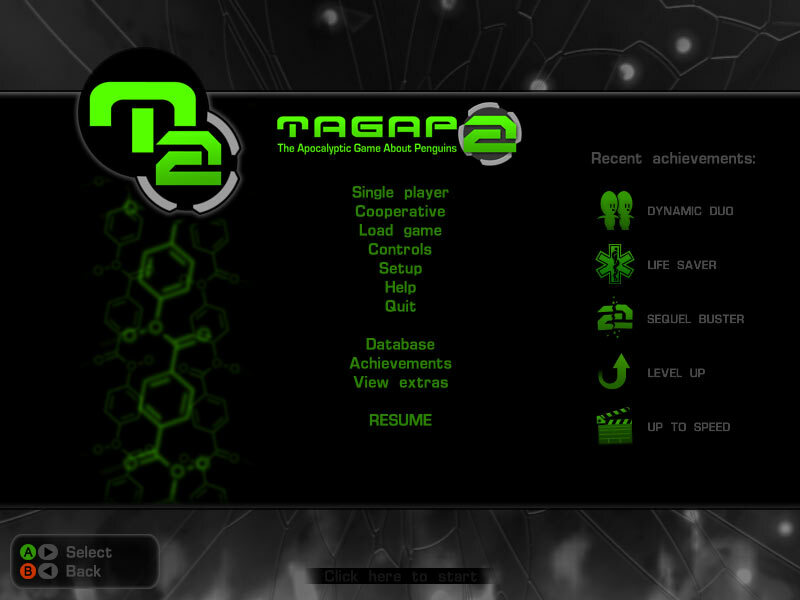 So, this is the TAGAP 2 main menu, available at the beginning or at any other time by pressing Escape and/or Start on gamepad. Always on the right – except when reading text or Database files, more on those later – are the most recent unlocked achievements. 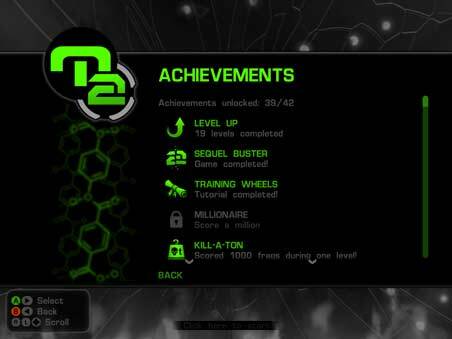 The achievements shown here are Dynamic Duo (complete two levels in co-op), Life Saver (save or be saved from death by OneUp in co-op), Sequel Buster (complete the game), Level Up (these are rewarded for every level you complete) and Up to Speed (watched the story recap). 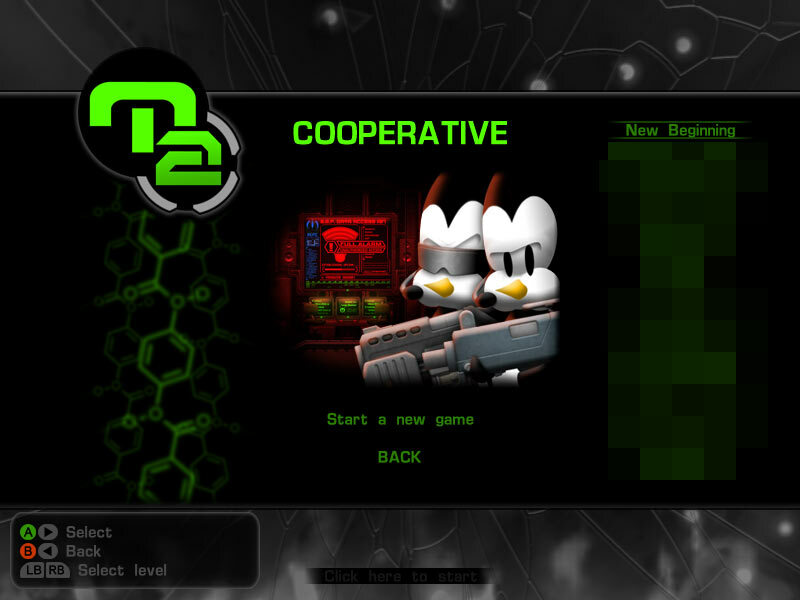 By selecting Single Player or Cooperative you enter the campaign menu. Starting a new game couldn't be simpler; Just pick the starting level – up to the one you've already reached – and hit Start a new game, or continue the previously saved campaign with Continue previous game. 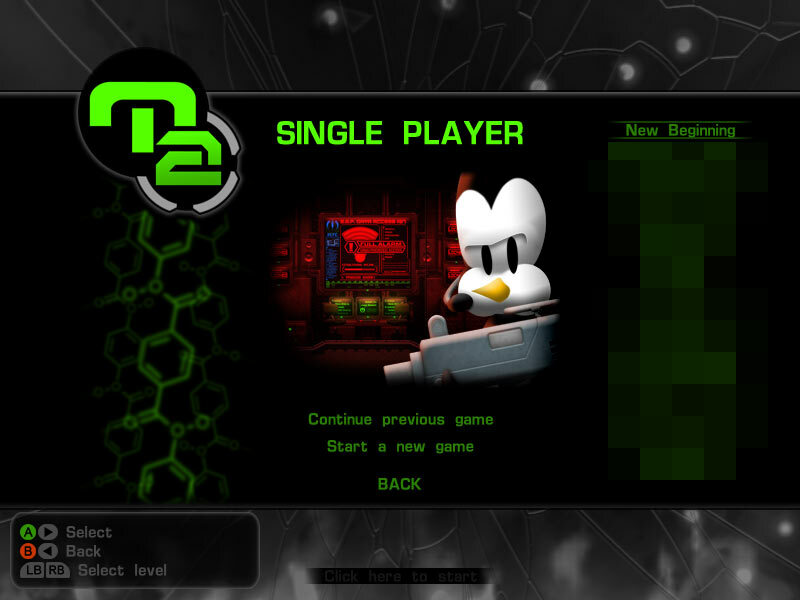 The latter works for both co-op and single player, the previous game played just happened to be a solo game. The reason of blurring is, you've guessed it, spoilers. I've completed the game so for me all the levels are unlocked. Also worth noting is that campaign progress works both ways; Levels completed in solo open them in co-op menu and vice versa. 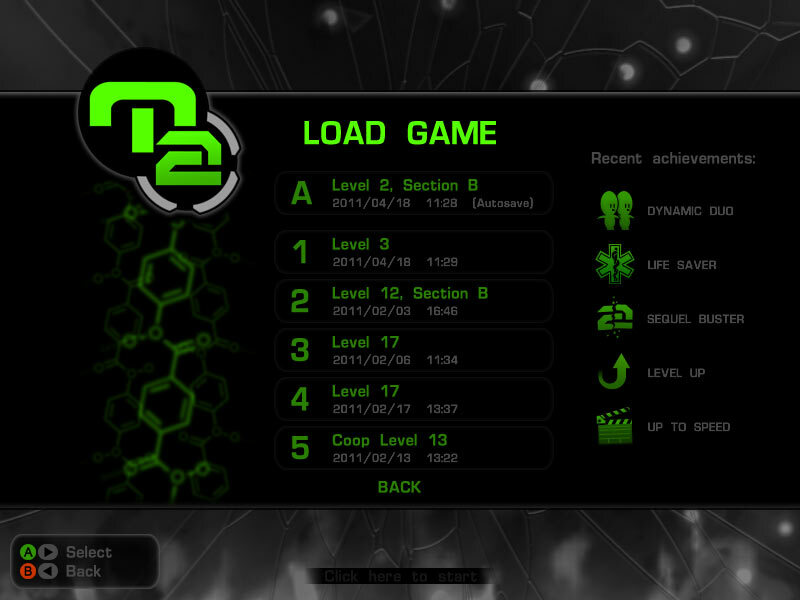 Smoother save game handling menu is a lot clearer than in the original TAGAP, showing everything you need to know what game is stored in each slot. 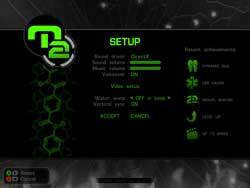 Again, configurations are split into Controls and Setup. 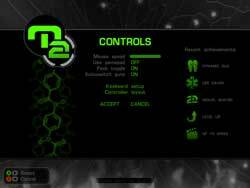 On controls side all the usual options are present, accompanied with fully customizable keyboard settings and view of the gamepad controls mapping. One thing that might still appear on the list is the ability control Aim assist. Currently it's automatically applied when playing with a gamepad, but we're currently testing should turning it off be a possibility. Don't worry, though; This isn't 'auto aim' in "Aliens" Smartgun sense, but instead checks where you are aiming at and slightly adjusts your aim if you are within 10 degree margin from a target. System Setup features are pretty much the same as in first TAGAP, with few important exceptions. Video setup is its own section, vertical sync is now an option and there is an ability turn Water warp on/off contextually depending on whether you are playing in splitscreen or not – a worthy alternative on slower machines like this laptop of mine. 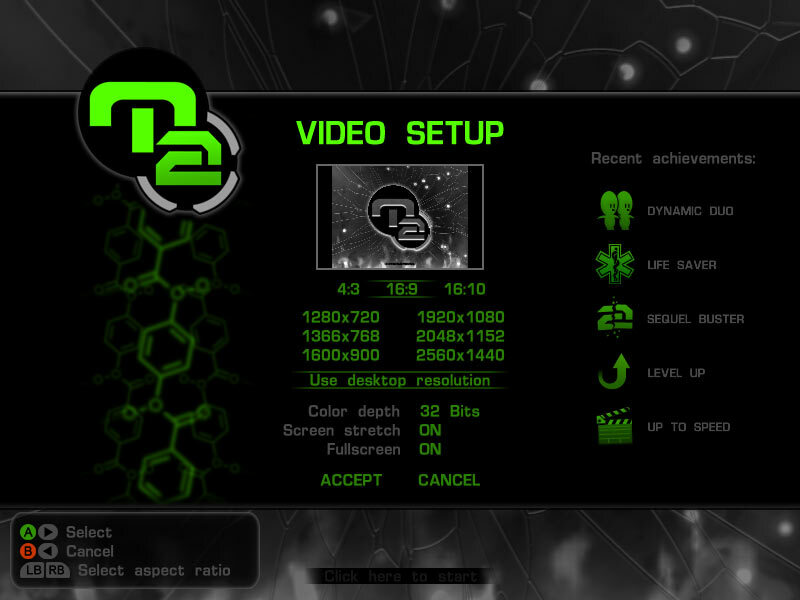 Video setup sub-menu grew from feedback on how limited the options were in the first TAGAP. This time you have wide variety of resolutions to choose from, from 4:3, 16:9 and 16:10 aspect ratios. And if you're desired resolution is not on the list, just hit Use desktop resolution button and you will revert to using the aspect ratio and settings of your Windows desktop – an option you are prompted with when you start TAGAP 2 for first time. In addition to all this, there is also a preview view to show what the game will look like with the chosen resolution and options. We skip Help and Exit as they are more than a little obvious – and head into Database. 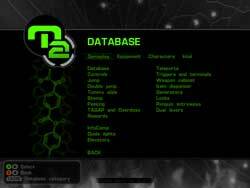 Database is your in-game manual, on-demand tutorial, tactics guide and collectible intel hub all rolled into one. 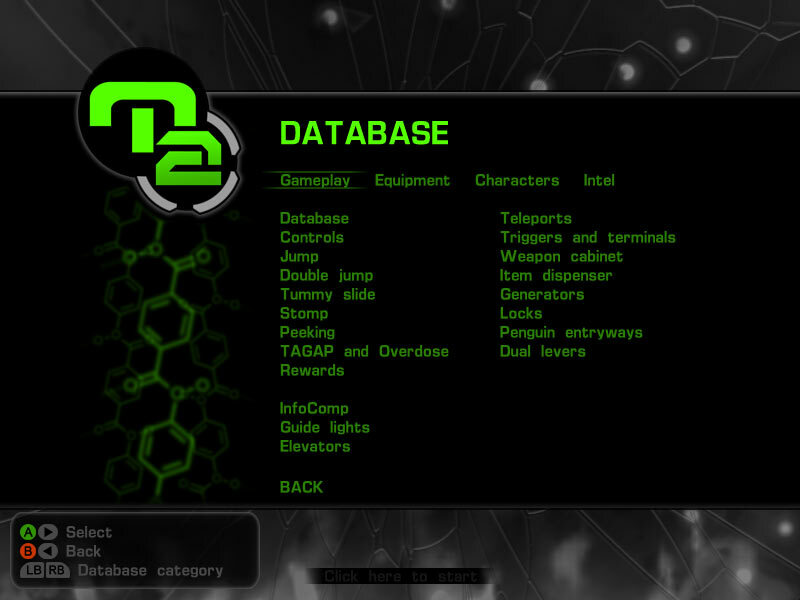 The Database is split into four categories; Gameplay is the gameplay manual, Equipment details all weapons, items and vehicles, Characters logs and profiles characters and enemies and finally Intel stores all the level and setting describing entries you'll come across. 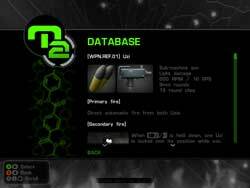 Database is automatically updated when pick up items, frag new kinds of enemies and read InfoComps. You can access it any time via the menu or by hitting F1 or Back button. The latter option will automatically open up the most recent unread entry. 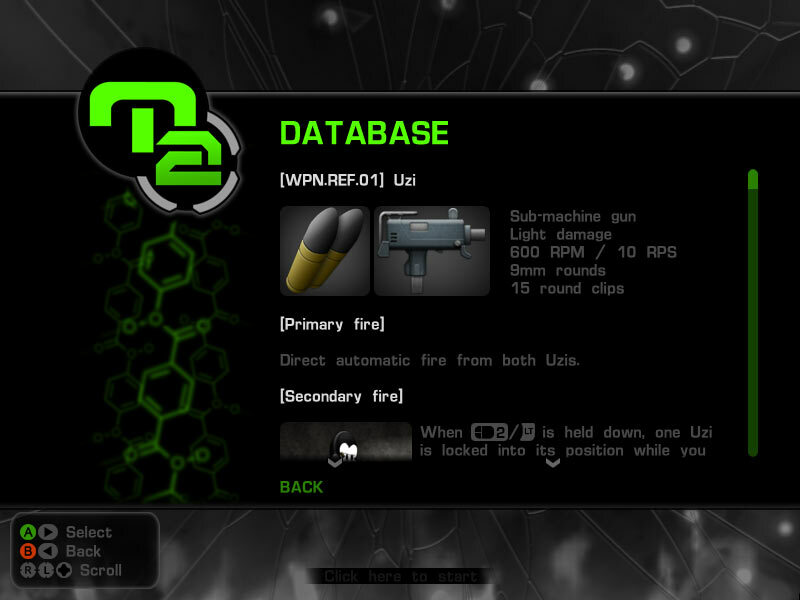 The example entry here is the description of your starting weapon, the dual Uzis. In addition to these basic details, each weapon entry also lists plenty of tactics for you to try out. Achievements are now available straight from the main menu and there is no need to load up the Extras in order to view them. Note that there are still a couple of achievements to add and a couple of old TAGAP 1 ones still to be removed from the system, so the achievement count here isn't final. Extras section is back with a blast, featuring the classic Jukebox, gameplay stats and the one gigantic art gallery filled with concept art and promo goodies. Few examples of the galleries were shown last week in the April 2011 status update. So, these are the menus of TAGAP 2. Like TAGAP 2 itself, they are familiar but a lot more intuitive, user-friendly and more attractive to look at.